They lived hundreds of miles apart, at a time when hundreds of miles in distance really meant something. They spoke the same language, but lived in what then were different countries. They didn’t come from the same backgrounds. Yet two very different couples had something very much in common. 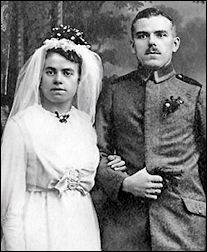 Both couples met, courted and — albeit in different years — married on the 31st of May. And, a half century later, in a very different world, their grandchildren — the ones you see here on the left — met, courted, married — and ultimately became my grandparents. It’s another of those odd coincidences so many of us find as genealogists. The quirks that go into making our family history — our stories — unique. The first to marry, on the 31st of May 1852 in the little village of Bad Köstritz in what was then the principality of Reuss jüngerer Linie, were Johann Christoph Gustav Graumüller and Auguste Wilhelmina Zimmermann. The intersection of the stories of these two very different families — one from the laboring class in the big city and the other from craftsmen in the far more rural east — came on the eve of the First World War. The family story is that Hugo Ernst Geissler was a soldier on leave in that big city, hanging around in a biergarten (beer garden), and that’s where he met Marie Margarethe Nuckel. Whether that’s true or not, it’s the family lore, and there’s no-one alive today to deny it. And you can’t help but think, here on this double wedding anniversary day, of all the decisions that had to be made just one way, things that had to happen just so, in order to result in the person sitting here right now, typing away as The Legal Genealogist. Happy anniversary to two separate sets of my second great grandparents. What a neat connection – good catch! Thanks! John Cardinal’s fabulous add-on program for Master Genealogist, called On This Day, really helps me see connections I might have missed otherwise. Aha! I had wondered how you are always so on top of dates! Thanks for the tip.